NAMM 2019 has been a blast so far this year. So many different companies have been coming forward with announcements on new products and lines that have never been done before. Native Instruments has certainly been keeping up their end as well. With just one day into the weekend event, they not only released one of the most portable, lightweight, and affordable interfaces we’ve ever seen — but now they have something completely new on the table. Introducing the Native Instruments Komplete Kontrol M32. The 32-key MIDI controller keyboard that is the company’s smallest keyboard design to date. It fits easily on any desktop surface and is compact and slim enough to be able to port around anywhere. The keyboard’s features include two touch strips off to the left hand side, eight touch-sensitive control knobs, control button features, an OLED display, and it connects to the computer via USB 2.0. The keyboard itself has synth action, unweighted keys, but for the small design, the keys are definitely big enough to navigate around with complete ease. Perhaps one of the coolest things about the keyboard is that when you purchase a Komplete Kontrol M32 MIDI keyboard, your purchase also includes copies of Monark, Reaktor Prism, Scarbee Mark 1, Maschine Essentials, Ableton Live 10 Lite, and Komplete Start. For a purchase as affordable as it is, for a product as small as it is, all of these included pieces of software are astonishing to us. Native Instruments has certainly put together a definitive all-in-one package for electronic musicians, hip-hop producers, and sound designers alike. All in all, Native Instruments has done a great job putting attention to detail and customer satisfaction at the top of the priorities list when announcing its latest Komplete Control M32 keyboard. 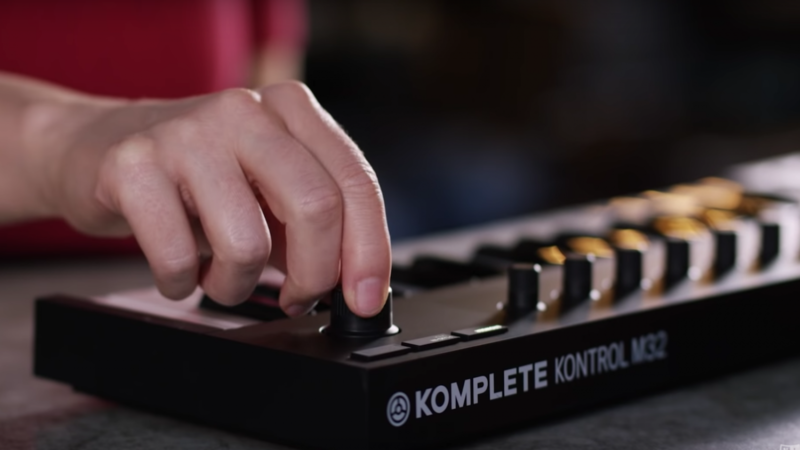 Price wise, the new Komplete Kontrol setup has a price tag of just $129, well worth all of its versatility and included features. You can get the Native Instruments Komplete Kontrol M32 MIDI keyboard for yourself from the links below.